For the 24 hours to 23:00 GMT, the EUR declined 0.33% against the USD and closed at 1.2328, after minutes of the European Central Bank’s (ECB) March meeting highlighted concerns around global trade conflict as well as the stronger Euro. According to the minutes, officials expressed deep concerns over a full-blown trade war with the US and fretted over its potential impact on the global as well as Euro-zone economy. Further, the Governing Council noted lack of evidence to describe inflation as durable and self-sustaining. Additionally, minutes highlighted the central bank’s concern about the impact of a stronger Euro on the region’s inflation growth and the broader economy. On the economic front, Euro-zone’s seasonally adjusted industrial production registered an unexpected drop of 0.8% on a monthly basis in February, dipping for the third straight month and defying market expectations for a gain of 0.1%. Industrial production had registered a revised fall of 0.6% in the previous month. The greenback advanced against its major peers, as geopolitical tensions eased after the US President, Donald Trump indicated that a military strike on Syria may not be imminent. On the data front, the number of Americans filing for fresh unemployment benefits declined to a level of 233.0K in the week ended 07 April, after recording a reading of 242.0K in the prior week, while markets were expecting initial jobless claims to ease to a level of 230.0K. In the Asian session, at GMT0300, the pair is trading at 1.2331, with the EUR trading slightly higher against the USD from yesterday’s close. 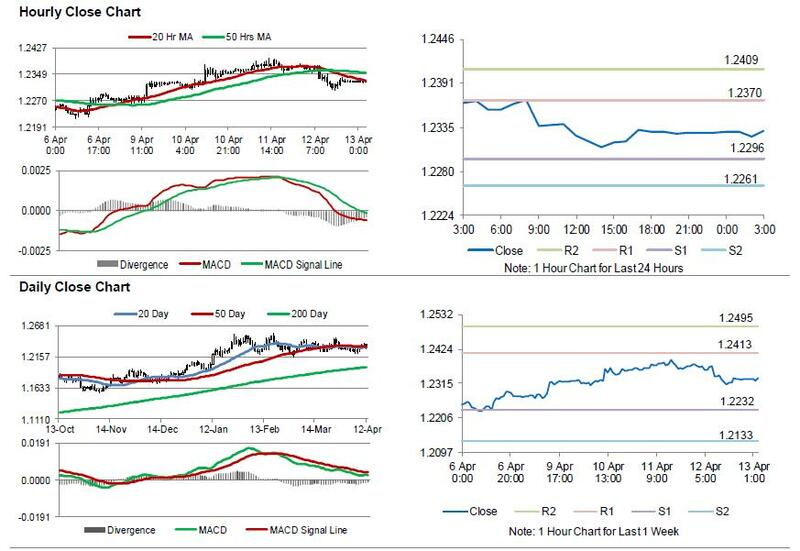 The pair is expected to find support at 1.2296, and a fall through could take it to the next support level of 1.2261. The pair is expected to find its first resistance at 1.237, and a rise through could take it to the next resistance level of 1.2409. Moving ahead, investors would look forward to Euro-zone’s trade balance figures for February as well as Germany’s final inflation numbers for March, both due to release in a few hours. Additionally, the US flash Michigan consumer sentiment index for April and JOLTs job openings data for February, both scheduled to release later today, will garner a lot of market attention.